Posted on October 15, 2017 October 28, 2017 by Emily S.
I had been to Amsterdam in 2012 and fell in love with the city quite quickly. The cycling, the canals, the buildings, the beer – all of these things are favorites of mine. Fast forward to Amsterdam 2017. We had a few more days to enjoy the city than I did in 2012 and I decided I wanted to find my heritage since all of my family at some point heralds themselves from Nederland. I was surprised at the connection I felt to this place. I have no living relatives there I know of, no memories to speak of, but I felt like the land was somehow “my land” and that feeling shaped much of the visit. 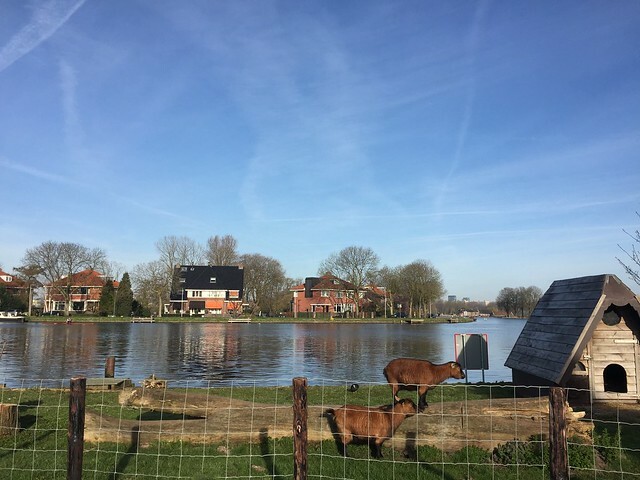 Thanks to our Pathport guide and some research by my aunt, we had a perfectly balanced visit seeing the culture of Amsterdam and the countryside of The Netherlands. Walking around the canals. This sounds cliche, but it is astounding how the water weaves it’s way through the city. Keeping nearby a major canal helps with wayfinding and gives some direction to which way the city is going. We also went to Groningen and the canals were just as impressive. There are house boats big and small as well as little rafts to hang out on a Friday night. Local small shops. One thing I struggle with living in London is the lack of little independent shops around the city (or rather, digging really hard to find them). Rents have gotten a bit too expensive for small shops to continue so I see independent shops less and less. There are so many lovely shops for independent clothing, knick knacks and homewares. Windmill Beers. I visited Brouwerij ‘t IJ back in 2012 and loved this small brewery. They serve the beer in small portions which is nice so you can try a few different types. I’d recommend sticking to only beer there though, the cheese was a bit interesting and they only serve snacks. Cyclists. I was more worried about being hit by a cyclist than any car. It seems like the city was built for bicycles and cars get the short end of the stick. I thought that the cycling thing was probably just a city thing. But no! We traveled to the country to see find my heritage and even along country roads in the middle of no where there were bike lanes. These lanes were not just painted lanes on the roads, they were separate, mini roads for cyclists. People certainly used them as well, old and young were out for a nice afternoon ride. International Cuisine. It certainly isn’t the first thing one may think of when visiting a country well known for it’s dairy, but Amsterdam has some fine cuisine. Our first night in the city we ate at a fantastic Spanish restaurant that was just what we needed after a crazy work week. We also had an incredible meal at Rainari. It is a tiny restaurant serving North African food. It’s simple and done so well. I’d recommend reservations. Friendly Faces. Amsterdam turned our views of “cities we don’t speak the language” around. While selfish, it was refreshing to be in a European city, enjoy the Dutch culture AND speak English with most people. On top of people knowing English, they were so welcoming to English speaking people. Every interaction we had with a Dutch person was positive and I smugly smiled to myself knowing my ancestors came from this land. Finding my family. As mentioned previously, we visited the towns where my ancestors lived and where my great grandparents spent their early years. We hired a car in Amsterdam quite easily and drove out into the countryside. In only a few moments away from Amsterdam we were driving between green fields and farm canals with no cityscape to be seen, how refreshing! Even in the countryside people were riding their bikes around, enjoying the day. My aunt had done quite a bit of research about where my great great grandparents lived in The Netherlands. I had her research printed and was ready to see the land they lived on. I had never searched for my “roots” before and felt like I had a special secret in my aunt’s research, a treasure map. We mapped out the information we had to try and make the most logical route across the countryside. Luckily, The Netherlands isn’t very big so we had a few hours drive to explore most points of interest. We arrived in the tiny village of Hantum where my great, great grandparents were married. There was just a single church there so we made the assumption that was it. It was incredible to walk around the church and know that people who ultimately had some hand in me being on this earth had been married there. It felt a bit like home in the strangest way. Proper “filter coffee”. The Dutch coffee culture is on point. They are in line with some of the best shops I can think of – dark, pure coffee done well. In London finding a filter coffee (read brewed, black coffee) is a feat. Would I like a long black instead? NO! I think my coffee inflexibility is one of the American traits that I am fiercely holding on to. Anyway, back to the Dutch. They had coffee at every turn and so much glorious, black filter coffee. I think my caffeine intake doubled during our four day stay. Long runs around the city. When we visited in March, I was training for a race in France. My weekends revolved around the long run and I was a little nervous about planning one in Amsterdam. I was pleasantly surprised in how easy it was to navigate using the canals as a guide. I was able to make an incredible loop that had full rivers, goats, green grass, inner city canals and leafy parks. It was one of the most enjoyable training runs I did, not to mention, insanely flat! The architecture. As an American, I struggle to fathom how old some of the buildings in Europe are and Amsterdam was no different. We wandered the streets in awe of the architecture. 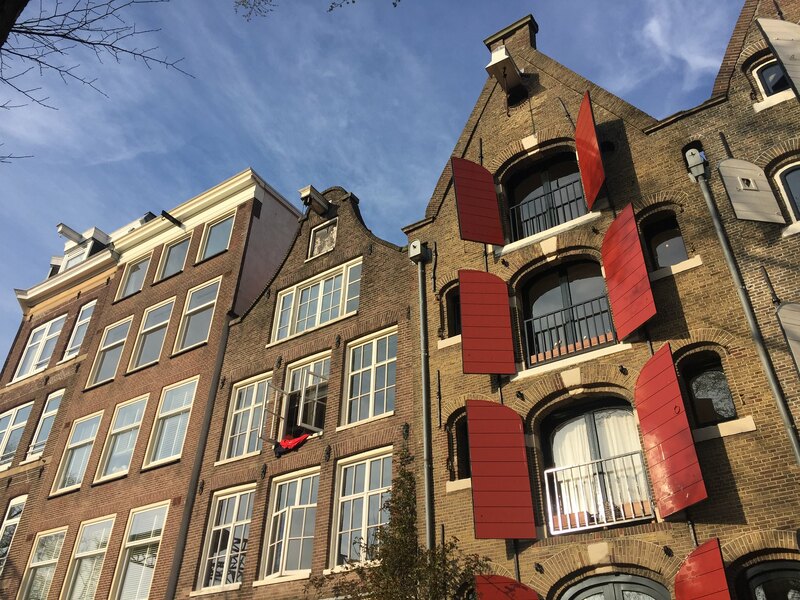 The hooks on the exterior used to move people’s belonging INTO the building, the windows that could be shut off with big wooden shutters when the winter winds below in, the detail dedicated to the buildings. I could spend days just wandering. So, there you have it. 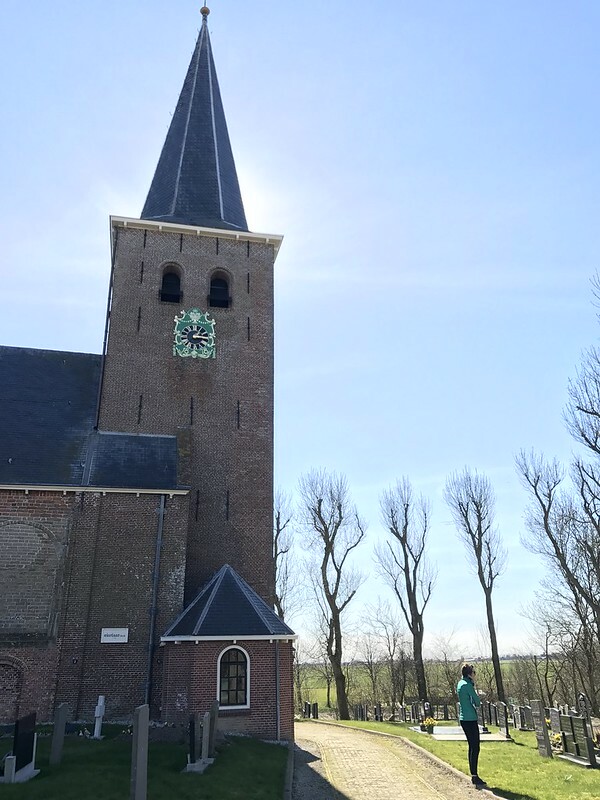 A brief (and long overdue) summary of our time in The Netherlands. So good to read your writing once again. Please post again. Love reading of your adventures!